When Olympic athletes who win gold, silver or bronze medals are caught violating the regulations of the Games, they must return their medals to the International Olympic Committee. In Olympics history, 143 medals have been stripped. When a media outlet is awarded a Pulitzer Prize for reporting as fact something that isn’t, should it return the Pulitzer? 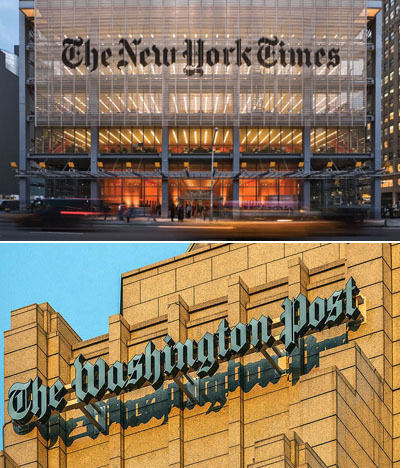 In 2018, the New York Times and Washington Post shared the Pulitzer Prize for their national reporting of President Donald Trump’s alleged collusion with Russia. They were awarded $15,000 in a joint prize. “Deeply sourced? Hardly. Relentlessly reported? Definitely,” Beth Baumann noted in a March 25 op-ed for Townhall. A Pulitzer has never been revoked. Robert Morton, President of FreePressFoundation.org, said the future of American journalism is hanging in the balance. “Either these awards should be rescinded or the New York Times and the Washington Post should uphold the highest traditions of the American Free Press and voluntarily surrender them,” he said. In 2003, Pulitzer considered rescinding the 1932 award to infamous New York Times’ Moscow correspondent Walter Duranty, who was an apologist for one of history’s bloodiest tyrants, Joseph Stalin. The 2018 award winning journalists reporting on Trump-Russia “collusion” were Maggie Haberman, Jo Becker, Matt Apuzzo and Mark Mazetti from the Times and Rosalind Helderman, Tom Hamburger, Ellen Nakashima, Adam Entous and Greg Miller from the Post. “And not just one or two or even three times, but for more than two years, the paper of record acted like a prosecutor making the case that Trump was at least compromised by Russia, and maybe even conspired with Vladimir Putin to steal the election,” Goodwin wrote.